Our bread can get stale, dry, mouldy or be eaten by other creatures such as rats. In order to make tea, we need to collect the leaves, dry them and add “hot” water to extract flavour and some “nutrients”. Tea does not do well in cold water. We boil the billy. Random specific (temere specifica) is the central relative status of an environment in the greater expanding universe, where molecular constructs have developed consciousness in our small corner of the universe — and possibly in another billion corners... So evolution gave us ways to interpret what we feel — or should feel. Our consciousness-support system is very complex — with sensors, interpreter, memory and active/reactive motions with a time limit of existence — and has evolved from the original molecular soup, that has been “happy” (reactive) to the incidentally propitious environmental factors at this level of universal expansion (which is in fact thinning out into nothingness). Such molecular constructs are random specific by interacting with a range of environmental specificity — which to say the least is quite narrow in the spectrum of stuff available in the universe — some of which being too hot or too cold for the formation and sustainability of life. For example, temperature specificity and availability of atoms are necessary for development in evolution, or making tea. It is simple, varied specific though a multiplicity of "evolved and devolved" species, though somewhat precariously balanced and influenced by small variations of the environment. From the perspective of Hobbes's critics the doctrines that lay at the heart of his atheism were materialism, necessitarianism, moral relativism and egoism, and scepticism concerning natural and revealed religion. Any thinker who endorsed doctrines of this kind was liable to be read as a follower of Hobbes and branded an “atheist”. During this period Hobbes was not without his followers. The most important thinker to become closely associated with Hobbes, in the minds of his critics, was Benedict Spinoza. In the Theological-Political Treatise (1670) Spinoza pursued a number of Hobbesean themes, including biblical criticism, scepticism about miracles and strong anti-clericalism. Spinoza's Ethics (1677) was also identified as containing Hobbist doctrines (e.g., materialism and necessitarianism) that led directly to atheism. Given these points of resemblance, Hobbes's critics in England were quick to link the names of Hobbes and Spinoza and they viewed “Spinozism” as simply a variant of the prevalent disease of “Hobbist atheism”. Whoever wants eudaimonia (to live well) must consider these three questions: First, how are pragmata(ethical matters, affairs, topics) by nature? Secondly, what attitude should we adopt towards them? Thirdly, what will be the outcome for those who have this attitude?" Pyrrho's answer is that "As for pragmata they are all adiaphora (undifferentiated by a logical differentia), astathmēta (unstable, unbalanced, not measurable), and anepikrita (unjudged, unfixed, undecidable). Therefore, neither our sense-perceptions nor our doxai (views, theories, beliefs) tell us the truth or lie; so we certainly should not rely on them. Rather, we should be adoxastous (without views), aklineis (uninclined toward this side or that), and akradantous(unwavering in our refusal to choose), saying about every single one that it no more is than it is not or it both is and is not or it neither is nor is not. The outcome for those who actually adopt this attitude, says Timon, will be first aphasia (speechlessness, non-assertion) and then ataraxia (freedom from disturbance), and Aenesidemus says pleasure. Adiaphora, astathmēta, and anepikrita are strikingly similar to the Buddhist Three marks of existence, suggesting that Pyrrho's teaching is based on what he learned in India, which is what Diogenes Laertius reported. Other similarities between Pyrrhonism and Buddhism include a version of the tetralemma among the Pyrrhonist maxims and a parallel with the Buddhist Two Truths Doctrine. In Pyrrhonism the Buddhist concept of "ultimate" (paramārtha) truth corresponds with truth as defined via the criterion of truth, which in Pyrrhonism is seen as undemonstrated, and therefore nothing can be called "true" with respect of it being an account of reality. The Buddhist concept of "conventional" or "provisional" (saṁvṛti) truth corresponds in Pyrrhonism to truth defined via the Pyrrhonist criterion of action, which is used for making decisions about what to do. It is worth recalling that, while "humanity" is the name of our species, it is also a name we give to a particular virtue ― the virtue of treating the other animals with kindness. We call societies devoted to the decent treatment of animals "humane societies." In giving the name of our species to that particular virtue, we make a claim for ourselves, that we are the species that practices the virtue we call humanity. Whether we live up to that name is entirely up to us ― that is also something that is special about our species. Unlike any other animal, we have a choice about how to live. We can simply be the cleverest of the animals, able to make efficient and profitable use of the others, engaging in only such benevolence as we can easily afford. Or we can be the species that practices the virtue to which we give the name of our species. We can recognise the other animals as fellow creatures, who share our fate, as conscious living beings struggling to get along in a world we never made. Benevolence towards other animals as fellow creatures, who share our fate, as conscious living beings "struggling to get along in a world we never made" is a statement that is too broad and lacks the gamut of sharing in our propria electionis. We try hard to eliminate some lifeforms such as those that give us diseases. We bait wild cats, rabbits, rats and we eat cows. And the “world we never made” is at a random specific relative stage for our survival at our location. Should we consider plants as “fellow creatures” as well, considering that plant life — through photosynthesis and providing vegetables and grains for sustenance — is maintaining life on this planet? The food chain is not "a chain" but a protein soup on a large scale of interaction of relative superiority — in which Proteasomes are protein complexes which degrade unneeded or damaged proteins by proteolysis, a chemical reaction that breaks peptide bonds. Enzymes that help such reactions are called proteases. And the processes of DNA survival are incessant. This is part of the random specific relative continuum, in which, humans, us, having evolved beyond our needs, we can activate our propria electionis, live and die. Pyrrhonist practice is for the purpose of achieving epoché, i.e., suspension of judgment. The core practice is through setting argument against argument. To aid in this, the Pyrrhonist philosophers Aenesidemus and Agrippa developed sets of stock arguments. • "The same impressions are not produced by the same objects owing to the differences in animals." • The same impressions are not produced by the same objects owing to the differences among human beings. • The same impressions are not produced by the same objects owing to the differences among the senses. • Owing to the "circumstances, conditions or dispositions," the same objects appear different. The same temperature, as established by instrument, feels very different after an extended period of cold winter weather (it feels warm) than after mild weather in the autumn (it feels cold). Time appears slow when young and fast as aging proceeds. Honey tastes sweet to most but bitter to someone with jaundice. A person with influenza will feel cold and shiver even though she is hot with a fever. • "Based on positions, distances, and locations; for owing to each of these the same objects appear different." The same tower appears rectangular at close distance and round from far away. The moon looks like a perfect sphere to the human eye, yet cratered from the view of a telescope. • “We deduce that since no object strikes us entirely by itself, but along with something else, it may perhaps be possible to say what the mixture compounded out of the external object and the thing perceived with it is like, but we would not be able to say what the external object is like by itself." • "Based, as we said, on the quantity and constitution of the underlying objects, meaning generally by "constitution" the manner of composition." So, for example, goat horn appears black when intact and appears white when ground up. Snow appears white when frozen and translucent as a liquid. • "Since all things appear relative, we will suspend judgement about what things exist absolutely and really existent. Do things which exist "differentially" as opposed to those things that have a distinct existence of their own, differ from relative things or not? If they do not differ, then they too are relative; but if they differ, then, since everything which differs is relative to something..., things which exist absolutely are relative." • "Based on constancy or rarity of occurrence." The sun is more amazing than a comet, but because we see and feel the warmth of the sun daily and the comet rarely, the latter commands our attention. • "There is a Tenth Mode, which is mainly concerned with Ethics, being based on rules of conduct, habits, laws, legendary beliefs, and dogmatic conceptions." • I: that based on the subject who judges (modes 1, 2, 3 & 4). • II: that based on the object judged (modes 7 & 10). Superordinate to these three modes is the mode of relation. • Dissent – The uncertainty demonstrated by the differences of opinions among philosophers and people in general. • Progress ad infinitum – All proof rests on matters themselves in need of proof, and so on to infinity. • Relation – All things are changed as their relations become changed, or, as we look upon them from different points of view. • Assumption – The truth asserted is based on an unsupported assumption. • Circularity – The truth asserted involves a circularity of proofs. And yes, in our lifetime we might have imagined a million eternities. All to satisfy our ignorance of where we’re at in relation to the rest of the stars. But we keep prodding our small corner with little machines or invent useless gods. Gus is a rabid atheist. 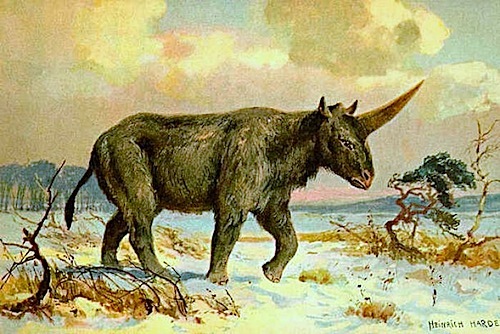 A mysterious shaggy giant species of rhinoceros — named the Siberian unicorn due to its enormous single horn — turns out to have survived in western Russia until just 36,000 years ago, according to research published today in Nature Ecology & Evolution. This extinction date means that the Siberian unicorn's final days were shared with early modern humans and Neanderthals. A key finding is that the Siberian unicorn did not became extinct due to modern human hunting, nor even the peak of the last Ice Age starting around 25,000 years ago.